Power PC Washer is a powerful software to clean system. This program allows you to clean your hard disks and registries. 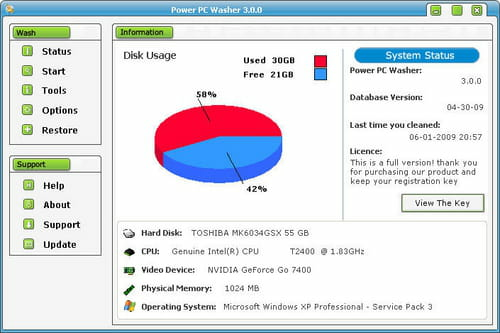 Power PC Washer can detect can locate your unutilized files and to delete them in order to free up your hard disk. It can also clean your activity history and correct errors in the registry which are the cause of bad performance of the PC. Power PC Washer uses high technology to clean and repair errors for better performance of the PC. Latest update on July 7, 2009 at 09:28 AM.